Because we didn't choose her then, because we choose not to forget her today...it is just our story! Some of our readers found within this book a reason to improve their lives, others found the strength to learn to enjoy the great things that life offers us more, while we often ignore them or take them for granted. If you want to know what you might find in this book, all you have to do is buy it and read it. One thing we can guarantee: every single Euro and every single cent of your purchase will help a child and family! Eleonora’s eyes is a true story based on actual events. It was written to offer simple and honest proof of what happens in a family when the joy of life meets the pain of death. The events recorded in the book forced the characters to confront life situations like the end of life and futile medical care, but these are not the main themes of the story. There’s no intention to talk about philosophical or ethical issues, it is, rather, the simple and true description of the events, without judgments or moral precepts, so that people who are facing the same difficulties can find the strength to confront such a difficult path, and those who have political responsibilities can better understand the human needs of families struck by such events. These are situations where the need of immediate support is just as important as hard scientific research work on the quest for effective treatments. 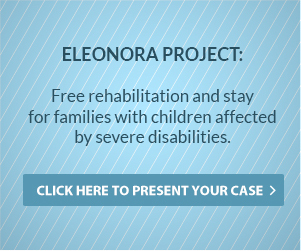 The readers, who buy and promote the book, help to support the association “Eleonora’s Dream: A Normal Life”, which receives all proceeds of book purchases and uses the money to finance all of its activities of support and improvement of the quality of life of patients, young and less young, and their families. Please note: before buying we would like to inform you that the entire proceeds go to the activities of the charity, without any deduction of royalties by the authors, the publisher or the retailer. An amount of 1.25€ per copy is used to cover a portion of the associated costs linked to the use of the warehouse and payment of mandatory taxes under the current legislation.